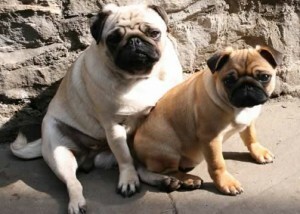 The Pug is a small, compact, deep chested dog belonging to the Toy Group of dogs. Strong and well muscled, it resembles more the battered prize-fighter than the charming, playful little companion dog that lies behind that compressed face. The Pug is what is referred to as a ‘cobby dog’, which is to say, one whose body length is roughly proportionate to its height.